Tony Moreno, accused of throwing his 7-month-old son, Aaden, off the Arrigoni Bridge to his death, told jurors Thursday he went to the bridge to kill himself, not his son. "Did you intend to kill your son, Aaden Moreno on July 5, 2015?" defense attorney Norman A. Pattis asked a tearful Moreno as he sat at the witness stand in Superior Court. "I dropped him," Moreno replied. 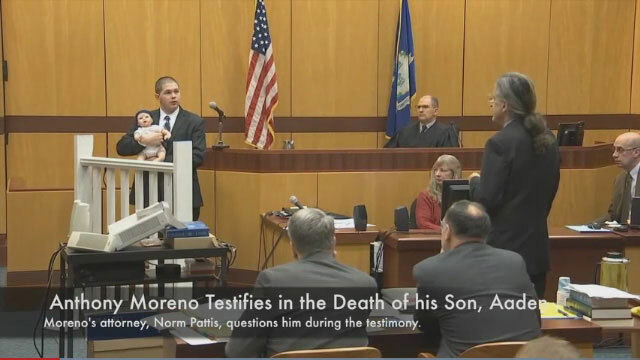 Moreno's emotionally charged testimony, in which he at one point held on to a baby doll in an apparent re-enactment of the moments leading to his infant son's death, appeared to take its toll on Moreno. Pattis, requested a delay until Friday morning because Moreno, distraught and choking back tears, was unable to continue his testimony. The day's court proceedings ended as it appeared Moreno was about to describe the moment he dropped his son. Moreno, 23, faces up to 70 years in prison if he is convicted of charges of murder and risk of injury to a minor. In his 45 minutes of testimony, Moreno told jurors that he battled deep depression and suicidal thoughts for years before Aaden was born. On the night of his son's death, Moreno said, he was walking along the bridge between Middletown and Portland, pointing out landmarks to Aaden, including the movie theater where he first kissed the boy's mother, Adrianne Oyola. With the doll in his arms and using a model of a section of bridge railing, Moreno demonstrated for jurors how he was standing with Aaden. "I picked him up out of the stroller and I was just walking back and forth talking to him," Moreno said. Pattis asked Moreno if, while leaning on the railing with Aaden essentially perched at the edge, he lost control of the child. After a long pause, Moreno was unable to collect his emotions long enough to answer the question. Judge Elpedio N. Vitale then excused jurors and called for a lunch recess. After the break, Pattis asked Vitale for a break in the proceedings Thursday and the judge agreed to let Moreno resume his testimony Friday morning. "It was unforeseeable to us that Mr. Moreno would have the difficulty answering that he did," Pattis told the judge. He said that if Moreno was unable to continue testifying in the same way Friday morning he would seek permission to ask leading questions to get through the rest of his testimony. Vitale said the day's session could resume Friday morning so Pattis and Moreno could have time to prepare in order to complete the testimony "given the potential ramifications if he is unable to continue." The defense strategy that Moreno was distraught and accidentally dropped his son from the bridge contrasts sharply with testimony given by state witnesses. Middletown police Officer Lee Buller testified earlier that Moreno told a Hartford Hospital psychiatrist that he "needed to kill his son then kill himself" in order to prevent Aaden from being raised by Oyola's family. Det. Dane Semper testified that Moreno told him he threw Aaden from the bridge like a free-throw shot in basketball, which would have sent the baby a distance from the bridge rather than dropping over the railing straight down. On Wednesday, prosecutors presented text messages between Moreno and Oyola, which included the message from Moreno, "Enjoy your new life without us." Much of Moreno's testimony focused on his thoughts of killing himself because of the way his relationship with Oyola had fallen apart. He proposed to her on the day of her high school prom, but she refused. Barely two weeks later, the day after her high school graduation, she applied for a restraining order against Moreno and said in her application that she feared for her safety and the safety of Aaden. The restraining order increased Moreno's thoughts of suicide, he said. When he sent text messages to Oyola that said Aaden was dead, the child was still alive at that point, he said. He was trying to hurt Oyola, and intended to kill himself but not his son. "I was still trying to decide whether or not me dying would have been the right thing. I thought he'd be better off without me," he said. "I had struggled with depression and thoughts of suicide for a lot of years prior to him being born and at the time I was having more issues with it. I didn't think I deserved to be a part of his life." Prosecutors Peter McShane and Eugene Calistro rested their case against Moreno Thursday morning after the testimony of Dr. James Gill, the state's chief medical examiner. Gill said Aaden's death was ruled a homicide by drowning. He said the child, found dead July 7, 2015, showed signs of decomposition consistent with having died two days earlier. Aaden had a 4-inch skull fracture and lung conditions consistent with a fall from a great height. He also had a froth around his nostrils when he was found, Gill said. Gill performed the autopsy on Aaden's body on July 8, 2015. "Seeing froth or foam coming from the mouth or nose in a person recovered from water leads me to believe the person was alive when they went into the water," Gill said. Under cross-examination, Pattis asked Gill if he found any signs during the autopsy that Aaden had a condition called myoclonus, which causes muscle spasms, apparently in an effort to introduce evidence that Aaden may have fidgeted at the time Moreno dropped him. Gill said there was no evidence of that condition, but said it may not be evident upon a postmortem examination. The jury viewed an autopsy photograph but the photo was not shown to the public in the courtroom. An envelope was passed from juror to juror, and each one was required to view the photo inside. Pattis until Thursday had not explicitly shown what his primary defense strategy would be. He asked the judge if pictures of Moreno with his baby could be shown to the jury as evidence. Vitale did not allow the photos to become evidence, ruling that they were not relevant to the jury's having to decide whether the state proved Moreno intended to kill the baby. "As he stood at the railing with his child deciding what to do, the child slipped from his grasp," Pattis said. "He intended to kill himself. He never intended to kill his son. The love this father had for his child rendered it impossible to kill him." Vitale also did not allow Pattis to ask questions about Moreno's willingness to plead guilty to charges lesser than murder. "We want the jury to know Mr. Moreno accepts criminal responsibility for his son's death. He was alone with his son when his son went into the water," Pattis said. "Mr. Moreno accepts responsibility for his son's death, but in his view it was not murder." On the night of his son's death, Moreno jumped from the bridge. He was rescued and hospitalized. After a two-day search of the river by authorities, a kayaker found the baby's body in waters near the East Haddam swing bridge.